When I started book blogging, i was doing tons of reading challenges, up to about 12. Then less and less. I was considering doing only the Classics Club for 2019, but then, I discovered another one I could NOT resist. Click on the icons to know more about them. This entry was posted in Classics, Mysteries, Reading Challenges and tagged Calendar of Crime, classics, Classics Club, Reading Challenges by WordsAndPeace. Bookmark the permalink. with reader extraordinaire Faith Hope Cherrytea! I need modest goals, since the time for reading and blogging is much less than in some years past. Wishing you joy in all you do in the coming year! that’s actually a big challenge! Happy New Year Lucy! Have fun with these! So far I’m doing three year-long challenges. 3 year-long? what are they? I am just now pondering what challenges I will set for myself. One will be a book a month set in another country than my own and translated from another language. 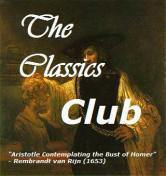 The Classics Club sounds good to me. I know another blogger who does something like this. I only do a summer reading challenge at the library where I work. We’re all encouraged to participate and I do it because it’s fun. But I tend to feel less relaxed when I know I have to read a bunch of books, even when they are books I want to read. So I try to be more casual about it during the rest of the year, although I’m committed to 2 specific books/month for the reading groups I’m in. But reading is almost always fun, as long as there is time! Happy New Year! This will be my third year with Passages to the Past’s Historical Fiction Reading Challenge, and I’m also starting the New Releases Reading Challenge as well this year.